If your leather watch band is too big, there is something you can do before you just change your watch band to ensure the perfect fit. Maybe over time your leather band has stretched out and it no longer fits the way you want, we can fix that too without completely replacing the band. You can use a hole punching pliers to add another notch to your watch band using our handy guide to make your band shorter to fit your wrist. 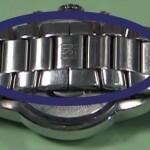 How will you know if this is actually the repair you need to make your watch band fit properly? Put the watch band on your wrist and close it on the tightest notch hole. If it is still too big on your wrist, you can use this guide to add another notch hole and make it fit just right. The first thing you will need to do is determine where you need to add a hole to your watch band. Start by putting your watch band on, but instead of hooking the tongue through any of the holes, just slide the band through the buckle and tighten it until it fits snugly on your wrist the way you want. Notice that when you have a watch band that fits correctly, the hole that the buckle tongue goes through is a few millimeters away from the buckle when it’s closed. Keeping in mind the way that a watch band will sit when it fits properly, take your marking pen and make a small mark in the middle of the watch band, a few millimeters on the inside of the buckle. This will ensure that your band won’t be too tight when you are done. Another option is to measure the distance between the current holes on your watch band and place your new hole at this distance. 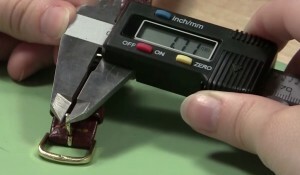 Using this method it will be difficult, if not impossible, to tell the watch band has been modified. When you know where you need to make the new hole, you will need to know what size hole punching pliers you need. To do this you will measure the tongue of the watch buckle, this is the part of the buckle that goes through the hole in the band to secure the band on your wrist. Take your digital gauge and measure the widest part of the buckle tongue, your punch diameter will need to be at least this large. Once you know the size of the tongue, you can select the hole punching pliers that will be best able to create a hole close in size to the tongue measurement. 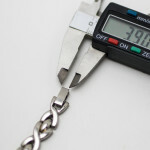 If there isn’t a pliers that matches the diameter of your buckle perfectly, choose the one with the next largest diameter so the hole isn’t too small. Lay your watch band out flat on your work space. Be sure that the long end with the holes in the band is easily accessible. Be aware that once you make a cut with your hole punching pliers, you won’t be able to undo it. 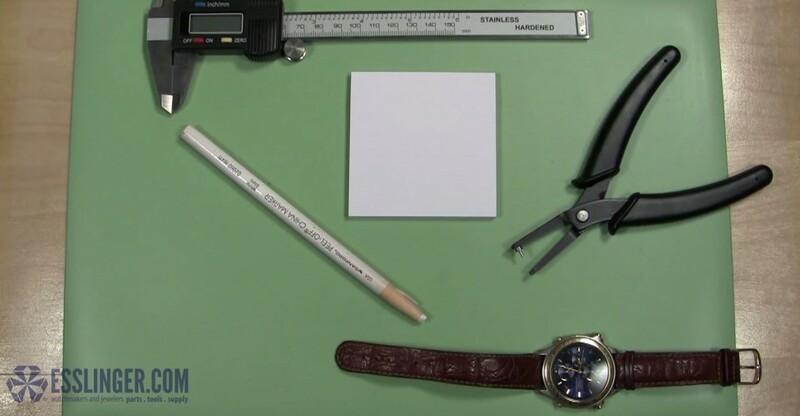 We suggest taking your notepad and taking a stack of papers roughly the thickness of your watchband punch a few test holes in the paper to familiarize yourself with the pliers. After you have a handle on how your hole punching pliers work, take the watch band and slide the long end in between the jaws. Position the mark you made on the band directly underneath the pin side of the hole puncher. Close the jaws until they are gripping the band lightly and you can be completely sure the pin puncher is in the correct position. When you are certain the puncher is in the right place, squeeze the pliers completely closed. You should feel and hear and feel a thunk when the pliers close and cut through the band. If you can’t push through the leather with just your hand, you can brace the bottom of the pliers against your table and push down on the jaws with both your hands together. Once you have created the hole, carefully open the jaws of the pliers and remove the leather band from the pliers. Be sure not to drag the band through the jaws or against the pin to keep from damaging the band or stretching the new hole you created. Try on your watch band again, it should fit just the way you always hoped it would. Best of all, if you have other watch bands like this that are too big, you can make them smaller to, whether they are plastic, rubber, nylon or fabric bands. However, if you do use this method to shorten nylon or fabric bands, you will want to use fabric cement to seal the edges of the hole and keep them from fraying. 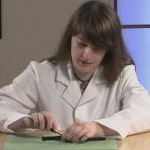 To learn more about watch repair or how to change or adjust your watch band, check out our Learning Center today!